(1) The brainstem consists of four components - reticular formation, midbrain, pons, and medulla. (2) Many rudimentary brainstem functions, namely protective reflexes, eye and body movements, and topographic map formation, have been "taken over" by the neocortex, though the brainstem contribution to these functions may resurface when the neocortex is damaged. (3) The brainstem's current main functions are to generate arousal thus optimizing memory formation, with wakefulness optimized for encoding and sleep optimized for consolidation, as well as to generate reward and stress thus optimizing immediate survival, with reward facilitating the pursuit of positive experiences and stress facilitating the avoidance of negative experiences. Being the oldest existing brain structure, the brainstem's roles have changed substantially over evolutionary time. It is now a conglomeration of smaller well-defined sub-structures, with a role in the processing operations of all of the other brain structures. We'll focus on the big picture, not the details. The brainstem proper is sandwiched between the spinal cord and the rest of the brain, and it consist of brainstem nuclei (groups of neurons in the central nervous system) and tracts (the projections of their axons) divided into four major components called the reticular formation, midbrain, pons, and medulla, the reticular formation is the oldest of these and runs centrally through the other three structures. The reticular formation is an ancient structure (Meyer, 1970). It is unlike the other three brainstem structures in that it runs along the entire length of the brainstem and consists of nuclei that resemble a net (in Latin, reticulum means "net-like structure"). It is subdivided into components and columns. The reticular formation is vertically organized into midbrain, pontine, and medullary components. The midbrain reticular formation projects to the thalamic intralaminar nuclei, which in turn project throughout the neocortex. It generates activity in the thalamus and neocortex, thus providing the main drive for wakefulness (Dubuc, 2014). The pontine reticular formation projects to the thalamic intralaminar nuclei and contains respiratory center nuclei. During rapid eye movement (REM) sleep, it activates the neocortex and produces the neurotransmitter acetylcholine (activates the neocortex) (Dubuc, 2014). It also regulates breathing. The medullary reticular formation projects to spinal motor neurons and contains vomiting, reflex, cardiac, respiratory, and vasomotor center nuclei. It inhibits spinal motor neurons during REM sleep to produce a near-total body paralysis (Kohyama et al, 1998). It also regulates vomiting, reflexes, heart rate, breathing, and blood pressure. The reticular formation is also organized into three columns that run through each of the components. 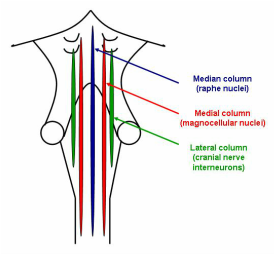 The median column/raphe nuclei projects up to the thalamus and neocortex as well as down to the spinal dorsal horn neurons (Wang and Nakai, 1994). It synthesizes the neurotransmitter serotonin (produces a state of well-being) and is strongly involved in pain modulation (Wang and Nikai, 1994). The medial column/magnocellular nuclei projects to the cranial nerves, forming reticulobulbar tracts, and to the spinal nerves, forming reticulospinal tracts. In mammals, the reticulospinal tracts contribute in a minor way to body posture and locomotion. The lateral column/cranial nerve interneurons surrounds the nuclei of the cranial nerves. They mediate cranial nerve functions. The midbrain forms the top of the brainstem. The ventral (front) region is called the tegmentum and contains several structures. The dorsal (back) region is called the tectum and consists of four little bumps called colliculi. Several structures in the midbrain control most vertical eye movements. The medial longitudinal fasciculus (MLF) controls vertical saccades (Pierrot-Deseilligny, 2011), reflex vertical eye movements (Jenkyn et al, 1978), and ensures that horizontal saccades remain tightly yoked (Chen et al, 2011). The occulomotor and trochlear nuclei connect with corticobulbar tracts and control most voluntary eye movements (Pierrot-Deseilligny, 2011). The Edinger-Westphal nuclei are responsible for eye convergence, pupil constriction, and the accommodation reflex. The red nucleus is an iron-containing pink structure that receives inputs from the cerebellum and neocortex and sends outputs via rubrospinal tracts to the reticular formation and spinal cord. The red nucleus and its rubrospinal tracts contribute in a minor way to shoulder and upper arm flexion as well as locomotion. The colliculi create "maps" which are used to build an internal representation of the world. The superior colliculus processes vision and is organized into seven layers. The top layer consists of a few scattered neurons and horizontally running axons whereas the lower layers are organized into discrete vertical columns (Ramon y Cajal, 1905). Each layer is a unique functional division (Northcutt, 2002) and contains a map used to direct eye movements and other behavioural responses towards specific points in space. The inferior colliculus processes sound and forms a massive convergence point for auditory pathways. It integrates auditory and somatosensory information to create a map of auditory space, with neurons dedicated to detecting sounds in specific regions of space (Purves et al, 2001). In the midbrain, there is a system of reward circuitry that rewards certain behaviours by releasing the neurotransmitter dopamine (produces a state of pleasure) so as to increase the probability of those behaviours being repeated (Olds and Milner, 1954). There are two midbrain structures in the reward circuit that produce dopamine. The substantia nigra (SN) is darkened by melanin and consists of two parts called the pars reticulata and the pars compacta. The pars reticulata is a major basal nuclei output structure and forms part of the basal nuclei (BN) circuits. The pars compacta contains dopamine and is intimately linked with the basal nuclei striatum. The ventral tegmental area (VTA) is the reward circuit origin and is involved in two major reward circuit pathways. The mesolimbic pathway projects from the VTA to the nucleus accumbens (a basal nuclei structure that acts as the brain's reward center), as well as to the hippocampus and amygdala, and plays a dominant role. The mesocortical pathway runs from the VTA to the frontal lobes and plays a lesser role. The SN and VTA are both crucial to basal nuclei functions. The periaqueductal gray (PAG) is gray matter and contains neurons that encircle the cerebrospinal fluid-filled cerebral aqueduct. This central position in the brain allows the PAG to act as an interface between the brainstem and higher brain structures. The PAG is a behavioural control interface (Benarroch, 2012), controlling the responses to internal stressors, such as pain, and external stressors, such as threats (Watson et al, 2013). The small bulge that is the pons lies between the midbrain and the medulla and contains several structures. Several structures in the pons control most horizontal eye movements. The paramedian pontine reticular formation (PPRF) is actually part of the reticular formation, but lies apart from the three major vertical columns. The PPRF controls ipsilateral saccades (Pierrot-Deseilligny, 2011) and voluntary horizontal eye movements. The abducens nuclei connect to the neocortex through corticobulbar tracts and control ipsilateral saccades, the horizontal vestibulo-ocular reflex, and voluntary horizontal eye movements (Pierrot-Deseilligny, 2011). (b) Head and face movement nuclei. The trigeminal, facial, and vestibular nuclei are connected to the neocortex through corticobulbar tracts. The trigeminal nuclei receive sensations from the face, send outputs to the jaw chewing muscles, and elicit the jaw jerk reflex; the facial nuclei receive sensations for taste from the anterior tongue and send outputs to facial muscles, some ear muscles, and the salivary glands, and along with the trigeminal nuclei elicit the corneal and glabellar reflexes; and the vestibular nuclei sense sound, rotation, and gravity, and mediate the vestibulo-ocular reflex. The azure blue nuclei of the locus coeruleus supply the neurotransmitter noradrenaline (produces a state of vigilance or readiness for action) throughout the central nervous system (Berridge and Waterhouse, 2003). Noradrenaline is involved in maintaining the brain in an activated state of wakefulness and plays an important role in synaptic modification (Berridge and Waterhouse, 2003). The medulla oblongata, or medulla, lies at the bottom of the brainstem and merges with the spinal cord. It contains several critical structures. The bulbar nuclei connect to the neocortex through corticobulbar tracts. The glossopharyngeal nuclei receive sensations for taste from the posterior tongue and send outputs to the stylopharyngeus muscle, involved in swallowing; the vagal nuclei send outputs to the rest of the laryngeal and pharyngeal muscles involved in speaking and swallowing, and along with the glossopharyngral nuclei produce the gag reflex; the accessory nuclei send outputs to the sternocleidomastoid and trapezius muscles, involved in rotating the head and shrugging the shoulders; and the hypoglossal nuclei send outputs to most of the tongue muscles for speaking and swallowing. The olives, a pair of oval structures, connect to the cerebellum through the olivocerebellar tracts and play a crucial role in cerebellar functions (Bengtsson and Hesslow, 2006; Watson et al, 2013). (c) Gracile and cuneate nuclei. The gracile and cuneate nuclei project upwards to form the medial lemniscus, a pathway that carries sensory information for fine touch, vibration, and proprioception to the thalamus. There are many vital and reflex center nuclei in the reticular formation - the cardiac center nuclei regulate heart rate, the respiratory center nuclei regulate breathing, the vasomotor center nuclei regulate blood pressure, and the area postrema regulates the vomiting reflex. - Magnocellular nuclei (including reticulobulbar and reticulospinal tracts). Serotonin pathways. The raphe nuclei produce serotonin and project to many different brain structures. - Eye movement nuclei (MLF as well as occulomotor, trochlear, and Edinger-Westphal nuclei). - Red nucleus (including rubrospinal tracts). - Colliculi (superior and inferior). - Reward circuitry (SN and VTA). Axial slice through the midbrain showing the MLF, occulomotor nuclei, red nucleus, SN, and PAG. The colliculi are four little bumps on the back of the midbrain. The superior colliculi (blue) create visual maps. The inferior colliculi (red) create auditory space maps. This is a drawing of the sparrow optic tectum, the precursor to the superior colliculus, by Santiago Ramon y Cajal (Ramon y Cajal, 1905). Note the layered structural arrangement, with a thin top layer of horizontally running axons and vertically running axons below. This layered structure is also seen in the neocortex. Dopamine pathways. The two main reward circuit pathways are the mesolimbic pathway (projects from the VTA to the nucleus accumbens, hippocampus, and amygdala) and the mesocortical pathway (projects from the VTA to the frontal lobes). - Eye movement nuclei (PPRF and abducens nuclei). - Head and face movement nuclei (trigeminal, facial, and vestibular nuclei). Noradrenaline pathways. The locus coeruleus produces noradrenaline for the entire nervous system and projects to many different brain structures. - Bulbar nuclei (glossopharyngeal, vagal, accessory, and hypoglossal nuclei). - Olives (including olivocerebellar tracts). - Gracile and cuneate nuclei (including medial lemniscus). The olives are a pair of oval structures intimately connected with the cerebellum through the olivocerebellar tracts. The rudimentary brainstem of earlier animals probably generated rigid motor programs. When the brain evolved into a memory system, most of these programs were replaced by a flexible memory system that was ultimately championed by the neocortex. However, some movements - particularly those useful given any situation - remain under brainstem control, and many earlier brainstem functions become more apparent in cases where the neocortex is damaged and can no longer suppress them. In humans, reflexes (involuntary and virtually instantaneous responses to stimuli) (Purves, 2004) are simple motor programs that remain under full control by the brainstem; there are also spinal cord-mediated tendon reflexes in the limbs, but we will only discuss brainstem reflexes here. The cranial nerve and reticular formation nuclei produce most of these reflexes. Primitive reflexes exist in human infants but disappear as the neocortex replaces them with learned behaviours - examples include the startle reflex (a falling infant spreads and then unspreads his or her arms) and the palmar grasp reflex (infants grab objects placed in their palm with a strong grip). Primitive reflexes are protective in infants but become unnecessary later, though they may reappear in adults if the neocortex is damaged. Cranial nerve reflexes are not replaced with age - examples include the pupillary light reflex (controls pupil diameter), the accommodation reflex (changes in lens shape, vergence, and pupil size allowing the eye to see near and far objects in focus), the corneal reflex (blinking when the cornea is touched), the vestibulo-ocular reflex (retina images are stabilized during head movement via an eye movement in the opposite direction), the jaw jerk reflex (tapping the jaw jerks the mandible upwards), and the gag reflex (a contraction at the back of the throat evoked by touch). The medullary reticular formation reflex center produces many protective reflexes - the area postrema nuclei induce vomiting to remove infected or poisonous stomach contents (Miller and Leslie, 1994), the cough center nuclei (Pantaleo et al, 2002) induce coughing to remove airway irritants and microbes, and the sneeze center nuclei (Seijo-Martinez et al, 2006) induce sneezing to clear the nasal cavities, to name but a few. There are three types of human eye movements (Purves, 2001). Smooth pursuits (smooth eye motions used to track a moving object) are coordinated by the MLF, occulomotor and trochlear nuclei, PPRF, and abducens nuclei. Saccades (rapid eye movements used to scan a visual scene, looking at the interesting bits first) may be vertical or horizontal and are coordinated by the same nuclei. Vergence (movements of the eyes in opposite directions so as to maintain binocular vision) is coordinated by the Edinger-Wesphal nuclei; if the eyes move towards each other, it is called convergence, and if they move away from each other, it is called divergence. The neocortex mediates voluntary human movements through the corticospinal and corticobulbar tracts. The corticospinal tracts pass through the medullary pyramids and are part of the pyramidal system (a voluntary motor system controlled by the neocortex). However, human movements are also partly controlled by an ancient brainstem motor system that does not pass through the pyramids, called the extrapyramidal system (an involuntary motor system controlled by the brainstem). The extrapyramidal system controls all movements in fish, amphibians, and reptiles as these creatures all lack a pyramidal system (Akers and Denbow, 2013), and movements in human infants such as crawling, as their corticospinal tracts do not fully myelinate until the end of the second year of life (Goshgarian, 2003). In adult humans, three main nuclei and their associated tracts stand out. The red nucleus and its rubrospinal tracts strongly stimulate upper limb flexors, control arm swing while walking, and probably also participate in gait adaptation to different terrain types (Jeneskog and Padel, 1984). The magnocellular nuclei and their reticulospinal tracts stimulate lower limb extensors and mediate postures and locomotion (Baker, 2011), making anticipatory gait modifications to walk over uneven terrain (Drew et al, 2004). The vestibular nuclei and their vestibulospinal tracts stimulate upper and lower limb extensors. Damage to the neocortex or its corticospinal tracts results in decorticate posturing, characterized by upper limb flexion (from the intact rubrospinal tracts) and lower limb extension (from the intact reticulospinal and vestibulospinal tracts). Damage to the midbrain or pons involves the red nucleus or its rubrospinal tract and results in decerebrate posturing, characterized by upper and lower limb extension (from the intact reticulospinal and vestibulospinal tracts). The maps created by the colliculi are more specifically called topographic maps (the projection of sensory information onto a central nervous system structure); the brain makes topographic maps in an effort to build an internal representation of the world. The superior colliculus makes visual maps. Prior to mammals, the superior colliculus was actually a larger structure called the optic tectum, but this reduced in relative size as the mammalian neocortex expanded (Northcutt, 2002); the much larger neocortex probably replaced the topographic mapping functions of the superior colliculus. There is evidence that the superior colliculus can still participates in visual topographic mapping in certain situations, as an individual with a damaged neocortex may be completely blind and yet still be able to detect visual stimuli (Morris et al, 2001). The neocortex may have also replaced most of the functions of the inferior colliculus too, although it still participates in sound filtering. Specifically, the inferior colliculus filters out sounds requiring immediate action, such as those made by prey or predators (Casseday and Covey, 1996), as well as self-effected sounds, such as speaking and chewing. A primitive reflex, the palmar grasp reflex, results in an infant grabbing any object placed in their palm with a strong grip. This disappears by the end of the second year of life. A cranial nerve reflex, the vestibulo-ocular reflex, stabilizes images on the retina during head movement by eliciting an eye movement in the opposite direction. This reflex can also be elicited by pouring cold or warm water into the ear, stimulating inner ear endolymph movement. Normally, cold water produces movement towards the same ear and nystagmus towards the opposite ear, while warm water produces movement towards the opposite ear and nystagmus towards the same ear. Saccades are rapid eye movements used to scan a visual scene. This is a trace of saccades scanning a face. The interesting bits, such as the eyes on the face, get a lot more attention. Vergence allows binocular vision to be maintained with changes in distance. When something is near, the eyes converge. When far, the eyes diverge. The pyramidal and extrapyramidal motor tracts (shown in red). The extrapyramidal system is an ancient motor system that consists of the red nucleus (including rubrospinal tracts), the magnocellular nuclei (including reticulospinal tracts), and the vestibular nuclei (including vestibulospinal tracts). The extrapyramidal system controls all movements in pre-mammalian vertebrates but in adult humans it is a minor contributor. Damage to the neocortex or corticospinal tracts above the red nucleus results in decorticate posturing, characterized by upper limb flexion (from the intact rubrospinal tracts) and lower limb extension (from the intact reticulospinal and vestibulospinal tracts). Damage to the midbrain or pons involves the red nucleus or its rubrospinal tract and results in decerebrate posturing, characterized by upper and lower limb extension (from the intact reticulospinal and vestibulospinal tracts). The colliculi and neocortex both construct topographic maps; this is the motor homunculus, which makes a map of the human body. The brain makes maps so that it can model the world. While the role of the brainstem in producing motor programs and topographic maps diminished and was replaced by other brain structures, it changed its primary functions so as to enhance that memory system. The brainstem is the ultimate source of signals that determine the state of arousal (the degree of brain interaction with the world). There is a spectrum of arousal, from wakefulness (a state in which the brain readily interacts with the world, driven by the midbrain reticular formation and thalamus) to sleep (a state of reduced motor activity, reduced motor responses to stimuli, stereotyped posture, and ready reversibility in which the brain does not readily interact with the world) (Rasch and Born, 2013). There are two major sleep states, non-rapid eye movement (NREM) sleep (absent eye movements, reduced muscle tone, and thought-like dreams, mediated by the thalamic reticular nuclei) and rapid eye movement (REM) sleep (rapid eye movements, absent muscle tone, and emotional dreams, driven by the pontine and medullary reticular formations) (Kohyama et al, 1998; Rasch and Born, 2013). The various states of arousal evolved to enhance memory formation which involves a lengthy process of memory encoding, consolidation, retrieval, and reconsolidation. We will discuss the stages of memory formation more in later chapters, but suffice to say that encoding and retrieval largely occur during wakefulness whereas consolidation and reconsolidation largely occur during sleep. Thus, memories can only be formed over time as the brain transitions between these various arousal states, and it is the brainstem that generates most of these states. However, since the thalamus is also critical in its role as an arousal mediator, we will delve into the details of wakefulness and sleep in chapter three. The state of reward (a physiological state that increases the probability of a behaviour being repeated) (Olds and Milner, 1954) facilitates the pursuit of experiences that generally have a positive effect on survival. As discussed above, the reward circuit involves the VTA, nucleus accumbens, hippocampus, amygdala, and frontal lobes, and it is mediated by dopamine produced by the SN and VTA. The reward circuit has been shown to be activated and strengthened by novel, unpredicted, and reward-predicting stimuli (Fields et al, 2007; Krebs et al, 2011; Ljungberg et al, 1992). Thus, the pursuit of novel (something never experienced before), unpredictable (something experienced before but in a significantly different context), and reward-predicting (something experienced before that resulted in reward) experiences generally must have a positive effect on survival. We will repeatedly discuss the concepts of novelty and prediction over the next few chapters as they relate to the core functions of the hippocampus and neocortex, respectively. The state of stress (a physiological state involving the entire body in which the individual experiences a challenge to their survival that overwhelms their coping resources) (Tottenham and Sheridan, 2010) facilitates the avoidance of experiences that generally have a negative effect on survival. Stress is initiated by the amygdala which via the hypothalamus stimulates the release of cortisol and adrenaline by the adrenal glands, as well as noradrenaline by the locus coeruleus, acetylcholine by the basal nucleus of Meynert in the forebrain, serotonin by the raphe nuclei, and dopamine by the VTA. Numerous physical effects follow, such as increased heart rate and pupil dilation. The PAG also plays a critical role in stress. It has been shown in rats that the PAG acts as an interface for behavioural control in stressful situations. When the rat PAG is stimulated, endogenous opioid neurotransmitters are released resulting in a profound analgesia (the reduction or elimination of pain) (Fardin et al, 1984). This is an internal effect. Stimulating another area elicits defensive behaviours such as freezing, jumping, and running (Bandler et al, 1985). This is an external effect. Thus, in rats and perhaps humans, the PAG has a profound influence on behavioural responses to internal and external stressors (Benarroch, 2012). Arousal evolved to create brain states that are optimized for different stages of memory formation. There is a spectrum of arousal, from wakefulness to sleep; wakefulness is a brain state optimized for encoding and retrieval whereas sleep is optimized for consolidation and reconsolidation. A Skinner box is a type of box used to study reward in rats. Low-voltage stimulation of the septal region of the brain gives the rat pleasure and can be used to teach the rat to solve problems (Olds and Milner, 1954). The brainstem contains most of the circuitry for generating a physiological state of reward; the reward circuit is activated and strengthened by novel, unpredictable, and reward-predicting experiences. The amygdala initiates the stress response, which is then further generated by several structures throughout the body; there is a heavy contribution from the locus coeruleus, raphe nuclei, and VTA of the brainstem. If we accept that the rudimentary brainstem simply stored and executed rigid motor programs, then these programs could not be rearranged and modified and hence the rudimentary brainstem could not learn (acquiring new behaviours or modifying existing ones). Learning appeared later in evolution as a key feature of the memory system involving other brain structures such as the basal nuclei, cerebellum, and neocortex. However, some parts of the brainstem became involved in learning by the memory system. In reinforcement learning, a reward system is used such that correct actions are rewarded, but if an incorrect action is performed then the learner is only criticized and not taught the correct answer (Skinner, 1948). The basal nuclei is the brain structure specialized for reinforcement learning (Doya, 1999). The SN is part of the basal nuclei and we will examine its role in basal nuclei reinforcement learning in chapter four. In supervised learning, correct actions are noted, and if an incorrect action is performed then the learner is taught the correct answer. The major feature of supervised learning is that it is error-based; errors are noted by a "teacher" and the correct answer - what the action should have been - is provided. The cerebellum is the brain structure specialized for supervised learning (Doya, 1999). The olives play a vital role in cerebellar learning and we will see how this happens in chapter five. In unsupervised learning, the learner must reorganize the information they receive according to their own internal rules so as to find hidden patterns. There is no reward, critic, or teacher - in fact, there is no such thing as a correct or incorrect action. With help from the thalamus, the neocortex is the brain structure specialized for unsupervised learning (Doya, 1999). As we shall see in chapter eight, the neocortex builds multisensory topographic maps. In the brainstem, we have already noted that the colliculi also build visual and auditory topographic maps which still contribute to visual and auditory sensory information processing. Reinforcement learning. Here the learner is expected to look at a shape and press the correct button out of three choices. If the correct action is performed, a reward is granted. If an incorrect action is performed, the learner is criticized but not taught the correct answer. The SN is critical to basal nuclei reinforcement learning. Supervised learning. If the correct action is performed, it is noted. If an incorrect action is performed, the learner is taught the correct answer. The olives are vital to cerebellar supervised learning. Unsupervised learning. There is no reward, critic, or teacher. Instead, the learner must reorganize information based on their own internal rules to construct a topographic map which can be used to predict patterns. The colliculi use unsupervised learning to construct topographic maps, although the neocortex is the dominant unsupervised learning structure in the human brain. The brainstem generates arousal, reward, and stress, and by doing so, forms the "instinct" that underlies all behaviour. Its apparent structural complexity is much easier to grasp when this simple fact is recognized. It would be a mistake to think that its functions have entirely supplanted by other structures such as the neocortex, and a mistake to deny its influence on behaviour. Akers and Denbow. 2013. Anatomy and physiology of domestic animals. John Wiley & Sons. Baker. 2011. The primate reticulospinal tract, hand function and functional recovery. Journal of Physiology 589(23), 5603-5612. Bandler et al. 1985. Identification of midbrain neurones mediating defensive behaviour in the rat by microinjections of excitatory amino acids. Behavioural Brain Research 15(2), 107-119. Benarroch. 2012. Periaqueductal gray: an interface for behavioral control. Neurology 78(3), 210-217. Bengtsson and Hesslow. 2006. Cerebellar control of the inferior olive. Cerebellum 5(1), 7-14. Berridge and Waterhouse. 2003. The locus coeruleus-noradrenergic system: modulation of behavioral state and state-dependent cognitive processes. Brain Research 42(1), 33-84. Casseday and Covey. 1996. A neuroethological theory of the operation of the inferior colliculus. Brain, Behaviour, and Evolution 47(6), 311-336. Chen et al. 2011. The role of the medial longitudinal fasciculus in horixontal gaze: tests of current hypotheses for saccade-vergence interactions. Experimental Brain Research 208(3), 335-343. Doya. 1999. What are the computations of the cerebellum, the basal ganglia and the cerebral cortex? Neural Networks 12(7-8), 961-974. Drew et al. 2004. Cortical and brainstem control of locomotion. Progress in Brain Research 143, 251-261. Fardin et al. 1984. A reinvestigation of the analgesic effects induced by stimulation of the periaqueductal gray matter in the rat. Brain Research 306(1-2), 125-139. Fields et al. 2007. Ventral tegmental area neurons in learned appetite behaviour and positive reinforcement. Annual Review of Neuroscience 30, 289-316. Goshgarian. 2003. Spinal cord medicine. Principles and practice. Demos Medical Publishing. Jeneskog and Padel. 1984. An excitatory pathway through dorsal columns to rubrospinal cells in the cat. Journal of Physiology 353, 355-373. Jenkyn et al. 1978. Reflex vertical gaze and the medial longitudinal fasciculus. Journal of Neurology, Neurosurgery, and Psychiatry 41, 1084-1091. Kohyama et al. 1998. Inactivation of the pons blocks medullary-induced muscle tone suppression in the decerebrate cat. Sleep 21(7), 695-699. Krebs et al. 2011. Novelty increases the mesolimbic functional connectivity of the substantia nigra/ventral tegmental area (SN/VTA) during reward anticipation: evidence from high-resolution fMRI. Neuroimage 58(2), 647-655. Ljungberg et al. 1992. Responses of monkey dopamine neurons during learning of behavioural reactions. Journal of Neurophysiology 67, 145-163. Meyer. 1970. A historical note on the ascending reticular formation of the brain-stem. Psychological Medicine 1(1), 13-17. Miller and Leslie. 1994. The area postrema and vomiting. Frontiers in Neuroendocrinology 15(4), 301-320. Morris et al. 2001. Differential extrageniculostriate and amygdala responses to presentation of emotional faces in a cortically blind field. Brain 124, 1241-1252.Northcutt. 2002. Understanding vertebrate brain evolution. Integrative and Comparative Biology 42(4), 743-756. Olds and Milner. 1954. Positive reinforcement produced by electrical stimulation of septal area and other regions of rat brain. Journal of Comparative and Physiological Psychology 47(6), 419-427. Pantaleo et al. 2002. Central nervous mechanisms of cough. Pulmonary Pharmacology and Therapeutics 15(3), 227-233. Pierrot-Deseilligny. 2011. Nuclear, internuclear, and supranuclear ocular motor disorders. Handbook of Clinical Neurology 102, 319-331. Purves et al. 2001. Neuroscience, 2nd Edition. Sinauer Associates. Purves. 2004. Neuroscience, 3rd Edition. Sinauer Associates. Ramon y Cajal. 1905. Structure of the nervous centres of the birds. Rasch and Born. 2013. About sleep's role in memory. Physiological Reviews 93, 681-766. Seijo-Martinez et al. 2006. Sneeze related area in the medulla: localisation of the human sneezing centre? Journal of Neurology, Neurosurgery, and Psychiatry 77(4), 559-561. Skinner. 1948. Walden Two. Toronto: The Macmillan Company. Tottenham and Sheridan. 2010. A review of adversity, the amugdala and the hippocampus: a consideration of developmental timing. Frontiers in Human Neuroscience 3(68), 1-21. Wang and Nikai. 1994. The dorsal raphe: an important nucleus in pain modulation. Brain Research Bulletin 34(6), 575-585. Watson et al. 2013. The olivo-cerebellar system and its relationship to survival circuits. Frontiers in Neural Circuits 7(72).